Theory 1. Batteries stop working due to a buildup of sulfation over the plates. Theory 1. is better at explaining why batteries stop working prematurely. Leisure marine, light aircraft, military vehicle, golf-car, automobile and truck batteries can be subject to lengthy periods inactivity and sustained discharge. These batteries become sulfated as result of (a) painfully inadequate alternator-regulator and battery-charger-controller product design and (b) lead-acid's intrinsic chemical vulnerability. Affected batteries are simply not receiving sufficient charge to help them perform the work expected from them. Theory 2. is better at explaining what happens as batteries get old and stop working. The way in which motive power batteries are operated provides a reliable and accurate fast-forward testbed that shows how batteries age. Motive power batteries are given a slight overcharge at the end of every charge to shorten the charging period. This causes mild corrosion of the grids that support the positive plates, in turn, causing progressive shedding of the positive active material and, over time, a gradual loss in the ampere-hour capacity of the batteries. Batteries that are regularly given a mild overcharge experience corrosion, have a life expectancy of 4 to 8 years. Engineering consultants, scientists, mainstream text books, battery professionals and experienced battery users all agree that it is corrosion, not sulfation that sets the upper limit on battery life expectancy. This is no conspiracy, no controversy - it is a fact. The subject has long been the elephant in the room for battery manufacturers. They prefer not to put too much emphasis on ground breaking research, apparently fearing that if a solution is found, it will result in a reduction in battery sales. Quick connect opens automatically when coupled to deliver water, closes automatically when uncoupled, provides automatic flow control. Ideal for single point battery watering. Dosing ratio is fixed at 1:125. There is no flow-back into containers/ water supply. Small batteries use less water, receive less supplement. Large and hard working batteries use more water, receive more supplement. 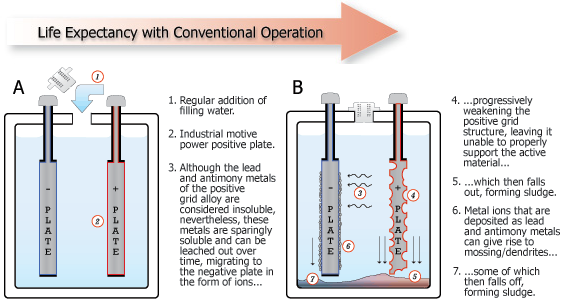 Battery makers have traditionally directed their corrosion control measures at the positive plates. The chemical environment at the positive plates is extremely hostile, which reduces the effectiveness of these measures. The technology we developed is directed at the negative plates. It compels the negatives to perform the groundwork that protects the positives from being corroded. It incorporates the core principles of nature's master blueprint of longevity, that of vitamins. Vitamins are regulators. Our technology regulates the activity inside lead-acid battery cells. That is why we called our technology Batteryvitamin. Batteryvitamin sidesteps the disadvantages that limit the effectiveness of traditional corrosion control measures. It can add more than 40% extra service life to batteries that were built to traditional premium corrosion control specifications. The way in which the lead-acid battery works cannot be discussed in terms of chemistry alone. The interactions that occur at the electrode surfaces are governed by the laws of physics. Batteryvitamin extends battery life using physics, not chemistry. It establishes a metal ion selective barrier on the negatives, which operates at a nanoscale level and projects corrosion resistance onto the positives via the intervening battery acid electrolyte. This process is described briefly on this page and in detail on other pages of this website. 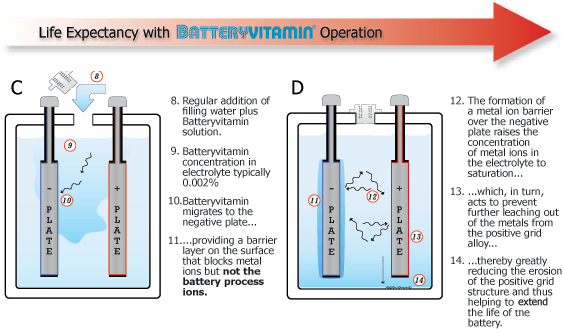 Batteryvitamin L must be added to the battery refill water. This can easily be done automatically. Batteryvitamin L is perfectly matched to the day-to-day operation of motive power batteries, typically forklift or forklift-type batteries used in supermarket/ logistics/ manufacturers' warehouses, on factory production lines and in mining operations. It is also suitable for golf-cart batteries. Dosing batteries in this way automatically adjusts for the different sizes of batteries, as well as their varying workloads. Desulfation was eligible for the treatment of 157,000 motive power batteries. Batteryvitamin L was eligible for the treatment of 2,983,000 motive power batteries. Desulfating motive power batteries is a labor intensive process - approximately 10 batteries/ person/ day. Batteryvitamin L is an automated process - one person can easily supervise 20,000 motive power batteries. Business model comparison: Desulfation is labor + overheads + margin. Batteryvitamin L is hi-tech/ actuarial. Batteryvitamin L is an up-and-coming heavyweight in industrial battery maintenance, leasing and insurance. Batteryvitamin technology represents a Unique Selling Proposition, ("USP"). Actual recorded cycling performance of two sets of batteries. Testing according to BCI specification. In a blind field trial run in a large automobile manufacturing materials handling facility, nearly 1,000 industrial motive power batteries received Batteryvitamin L from their sixth service year onwards by automatic dosing and by automatically controlled single point battery watering. After 10 years of service, about 52% of the original batteries were still in use, equivalent to a conservatively calculated increase in service life of 65%. Despite running about 26% batteries short at 10 years, Batteryvitamin L ensured there was always enough power for all the vehicles. Data from supplier battery register, historical battery usage and battery replacement patterns. When battery life is extended it translates directly into dollar savings. The total number of batteries that remained in use represented a value of around 2 million dollars that became available as working capital or as money that could have been banked. Chemically different, same electrochemical effects, superior performance compared to rubber separator technology. For more details of a technical nature, please refer to How is the Nanobarrier formed? Batteryvitamin L represents a major breakthrough that evolved out of research into substances that have been encoded or keyed with selected chemical and physical characterizations, to be carried by water to appointed areas of use and to carry out pre-assigned tasks. The unique properties of Batteryvitamin L can help to hold back previously inevitable corrosion of battery plates. 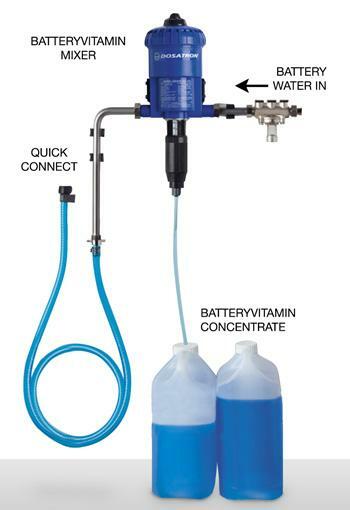 It can be used by repeated application in combination with single point battery watering - thereby providing a refresher service to the battery. As motive power battery cells age they use more water, some more than others. By using the replenishment water as the carrier, the cells that appear to need Batteryvitamin L the most, beneficially receive the most. Batteryvitamin L falls into a similar category as the ligno-sulfonates, extracted from wood, that must be included in the negative plates by battery manufacturers to preserve negative plate activity; and rubber separators, that suppress the cumulative negative effects of antimony in batteries. The nature of Batteryvitamin L makes it a powerful disinfectant - acting to prevent the Legionella, biofilm/slime and algae build up in the water supply in conformity with heath regulations. Batteryvitamin L can work best at a very low concentration. At about 5-30 parts per million, (ppm), in electrolyte, it appears to have a purely physical effect, without any really significant chemical interaction with the battery cells. Above 1,500 ppm tests showed a discernable chemical interaction can be expected. Batteryvitamin is typically slowly and harmlessly drawn in by the plates from the electrolyte, but above the recommended concentration is likely to be taken in increasingly faster - which therefore precludes an extra amount of Batteryvitamin L as storage in the electrolyte of the cells. This is why it is necessary to replenish the battery cells with diluted Batteryvitamin at regular intervals. Batteryvitamin is not suitable for treatment of a battery that begins when the battery is almost worn out. Batteryvitamin should not be used in an attempt to revitalize a defective, neglected or spent battery. As Batteryvitamin is used outside our control, we cannot accept liability for damages. Extraordinarily well made. Superbly reliable. Range of models to suit different applications. Also used extensively in horticulture and livestock; vehicle washing; chemical dosing; hygene and sanitation; printing; metal processing; etc.